Mainly Amaryllids Garden newsletter for June 2004. In this web space I'll let you know what is in bloom, seed that is setting, and updates from the garden. I hope to write a new newsletter each month, detailing what is happening here at Mainly Amaryllid Garden. 3. Plant of the month. It has been an excellent season for the smaller Amaryllids. Hessea tenella and Hessea pulcherrima both did quite well. This new sand/clay base collection bed works like a beauty! As we have had plenty of rain this past month I can see that the depth of the sand, (up to 2ft or 600 ml in places) has given me the opportunity to observe excellent drainage using this cultivation method, and the bulbs are flourishing! 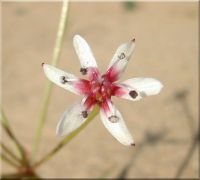 Above, Strumaria truncata in bloom. Many of the winter growers are now entering 3/4 growth of the foliage for the season. Most of the summer growers like Crinum and Ammocharis have died down now with the frost burning off their leaves. Boophone leaves, at least on the younger ones, are still in full growth! I am busy getting the summer garden ready now for Spring. This is when the Crinum start to bloom again. Until then, it's all maintenance. The winter garden is pretty care free except for weeding. I don't see these bulbs for most of the year. Our region has around 220 days of growing season so the summer growing bulbs predominate the garden for most of the year. 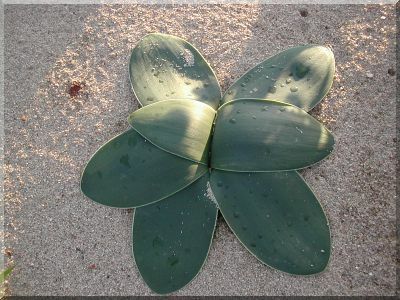 Bulbs such as Brunsvigia gregaria are really maintenance free bulbs. Pictured below, this species of Brunsvigia is one of the toughest and earliest to flower from seed. Interestingly, the leaves grow to form this beautiful effect and eye catching look. Brunsvigia gregaria, Cathcart form, growing at Mainly Amaryllids Garden 2004. 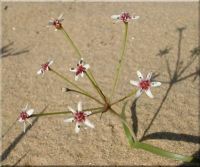 Above, Brunsvigia gregaria growing in situ, Cathcart, East Cape, South Africa. Images and Information about this wonderful place that is home to so many incredible bulbous plants. 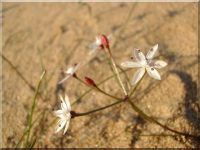 This site introduces the Family Amaryllidaceae. Introducing the new way to receive your latest copy of bulb information update about bulbs, and strictly for the discerning bulb enthusiast! 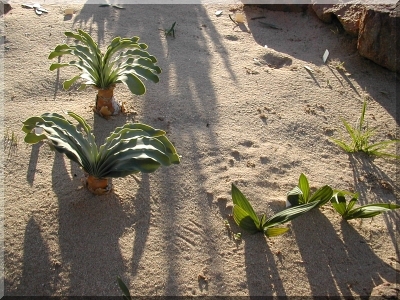 Cameron McMaster's 'Wild Bulbs of the Eastern Cape' disk is a must for your plant library. It has 100's of images, detailing the plants, their surroundings and informative notes that accompany these images. This is an excellent resource disk. 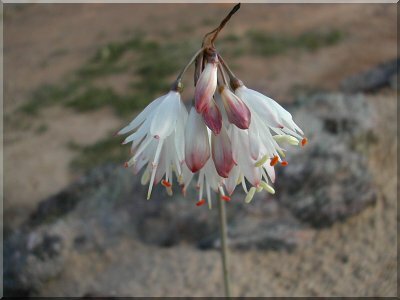 If you are into South African bulbs, you will want this one. Cameron is a well respected and noted naturalist and covers many genus on this disk including Agapanthaceae, Alliaceae, Amaryllidaceae, Araceae, Asphodelaceae, Brachystelmas, Colchicaceae, Eriospermaceae, Hyacinthaceae, Hypoxidaceae, Iridaceae and Orchidaceae. There is also an extensive collection of Landscape images, detailing the extraordinary habitat in which these bulbs grow. The disk comes complete, ready to view. The cost is AU$75.00 this cost includes postage. Please contact me should you require more information about this exciting new information resource. Mainly Amaryllids Garden is very pleased to announce the availability of a rare species of Nerine. Nerine frithii � This species is one of the most beautiful of all the Nerines. 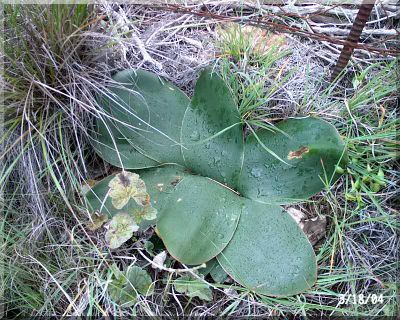 The plants are becoming rare throughout their distribution range owing to habitat destruction and over-grazing. They are now extinct in a large part of their former range in the North West Province. 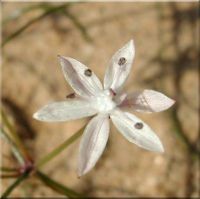 The flowers are white with reflexed petals and the centre of the flower is rich wine red. The flowers are borne in large congested umbels. These bulbs are small seedlings and are available this month for $8.50 each + postage. 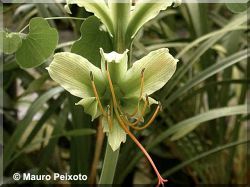 e) Hippeastrum calyptratum - A Green flowered Hippeastrum ( Pictured Below) - Seedlings - $9.50 each - Normally $13.50. I have been thinking of an idea about helping Amaryllid Enthusiasts expand their collections from others of a like mind, and perhaps also have a place on the web where you can swap or sell any excess bulbs and seeds (which all of us have eventually). Let me know what you think about this idea. If you want to get involved and have your information published online, send me the details and I will get it done. Please Note: Only Members of Mainly Amaryllids Garden information will be accepted. This will be a completely free service and posted on the web for every one to see. Below are some examples of what your membership at Mainly Amaryllids Garden can possibly . All prices quoted are in Australian Dollars Only. Mixed seeds of Lilium. Collected from my garden. I can give you details about the parents. $5.00/packet. Great colours! Haemanthus coccineus , 12 bulbs for sale, $15.00 each or best offer for the lot. All are flowering size. Thanks for another great month! "Friends stay, when your whole world crumbles down around you and all others have left the building, friends stay!"